Home » Who is the Fish Guy? You may know of Mark Collier by his other “name”—Arizona FishGuy. Mark has been designing, installing and maintaining custom aquariums for residential and commercial clients for nearly 25 years. He estimates his creations number several hundred. The Phoenix native says he was fascinated by fish and aquariums as a boy. His father was a hobbyist, and Mark spent much of his free time at the local fish store. He jokes that he was there so often the owner felt compelled to offer him a job, and he started working for the company after graduating from high school. For the next 10 years, he learned all he could about designing and installing tanks while also doing extensive research on fish. 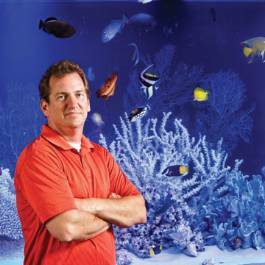 In the late 1990s, he branched out and started his own firm, Custom Marine Aquaria. Mark says that one of the things he enjoys most about his job is coming up with designs that push the boundaries of typical tanks. Mark approaches each and every installation as if it were a custom masterpiece whether building a 75 gallon free standing aquarium with standard cabinetry or a 2500 gallon built in with exquisite detail and top of the line life support.